Royalty Core RC7 Innovative grille is designed to provide accelerated airflow for your favorite truck. It is comprised of 10.0 Power mesh and 12.0 Sport Mesh in a Gloss Black finish that creates a two-tone look. The RC7 protects the engine compartment much better than a factory plastic grille. In addition, you will be supporting the American worker since all of our grilles are made by hand in the United States. The Royalty Core Grille is completely customizable. You can choose your color, finish, mesh size and studs. All of our grilles are comprised of T304 stainless steel that never rusts, and is made to have the best fit, the highest quality finishes and a superior mounting design. 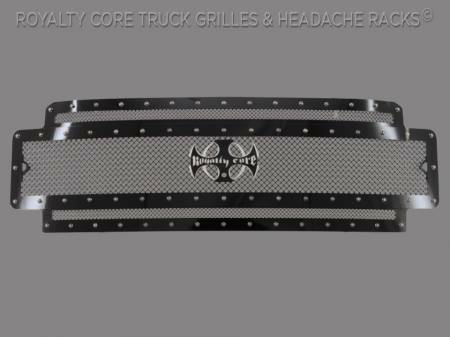 Royalty Core offers the largest range of aftermarket truck grilles. Shop for your RC6D grille now!